Monte dei Paschi di Siena, founded in 1427, is at the center of a banking scandal that could shake the Italian elections. Italy is grappling with a scandal at the world's oldest bank that could affect the outcome of elections next month and dent Mario Draghi's record as Europe's top central banker. Monte dei Paschi di Siena, founded in 1427, last week revealed it faced losses of up to €720 million on three derivatives trades, carried out in 2006-2009, details of which were kept hidden from regulators. Italy's third-biggest bank was forced to ask for €3.9 billion in state aid last year when it failed to meet tougher European capital standards, as losses on Italian government bonds weakened its balance sheet. If it is unable to repay the special bond, it may face nationalization. The bank's shares have lost 16% since posting a 2013 high on Jan. 7. The revelations have sparked a round of recriminations about who knew what, and when, about the derivative trades, drawing outgoing Prime Minister Mario Monti and European Central Bank President Draghi into the firing line. Draghi, who has been praised for his deft handling of Europe's credit crisis last year, was head of the Bank of Italy at the time the trades were carried out. He is due to take charge of EU banking regulation under plans for a single supervisory authority. Giulio Tremonti, a former economy minister in Silvio Berlusconi's government, has described Draghi's failure to prevent the trades during his time at the Bank of Italy as shocking. The ECB has declined to comment, while the Bank of Italy has accused the previous leadership at Monte dei Paschi of withholding critical information, subsequently made available by the new management. Monte dei Paschi appointed Alessandro Profumo, a former CEO at Italy's biggest bank Unicredit, as chairman last April, and Fabrizio Viola as new chief executive last February. Other observers believe Draghi did what he could. "There are some official documents from the Bank of Italy that point to the fact that the bank was engaged in very risky activities, and that some of the risks were not balanced and some were not properly accounted for on their books," Nicola Borri, assistant economic professor at LUISS Guido Carli University in Rome told CNN. "However, some of the revelations of (the) last few days point to the fact that the Bank of Italy might not have known some details of these derivatives," Borri added. Italian finance minister Vittorio Grilli told Parliament Tuesday that Bank of Italy oversight in 2010 had prevented Monte dei Paschi from carrying out similar trades, and dismissed suggestions that the scandal raised questions about the stability of the country's banking system. Monti has come under fire from political rival Silvio Berlusconi and his allies for agreeing to provide assistance to the bank. Monti steered Italy through the depths of the sovereign debt crisis last year at the head of a technocrat government, and is seeking re-election when Italians go to the polls next month. But he, in turn, has criticized the center-left Democratic Party, currently leading in opinion polls, for its close links to the bank. 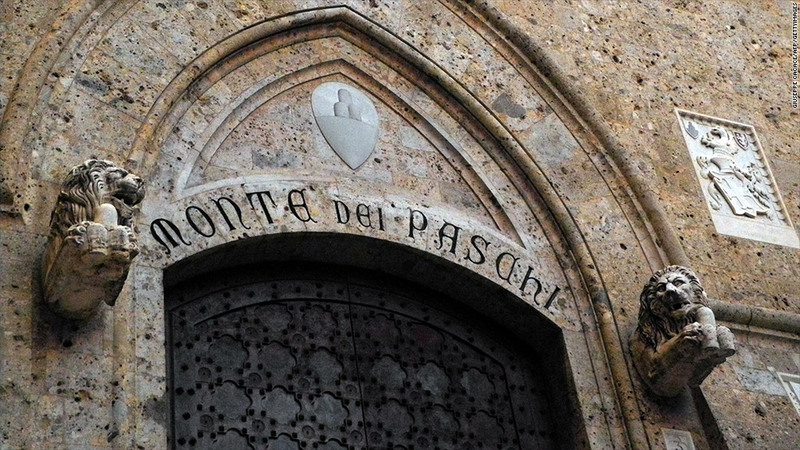 Democratic Party politicians control Monte dei Paschi's biggest shareholder. Italy faces a tough 2013. It has already been in recession for five consecutive quarters. The economy is believed to have shrunk by 2.4% in 2012, and is expected to contract again this year. Investors are hoping that the election delivers a government that continues with the fiscal consolidation and reform agenda introduced by Monti last year. The Democratic Party, led by Pier Luigi Bersani, supported many of Monti's reforms and could build a coalition with the former European Commissioner. But support for Bersani may slip as a consequence of the banking scandal, complicating his search for a workable majority in both houses of Parliament, particularly if his party loses a number of tight regional races to Berlusconi. "The Democratic Party needs to win in most regions to get a majority in the Senate, while the majority in lower chamber seems assured. So the impact might be important," Borri said.